“Do what you can, do it wisely, and most importantly do it now. A healthy ocean is not a luxury item. It is a necessity for survival. 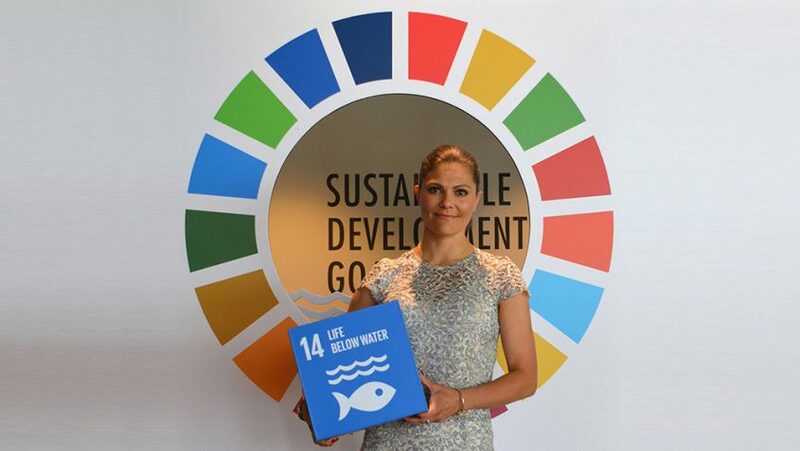 And taking care of the ocean means taking care of ourselves,” Crown Princess Victoria of Sweden said, as she addressed the Stockholm Resilience Centre event on “Engaging the private sector in SDG 14” on 9 June, taking place during the Ocean Conference at UN Headquarters in New York. One of 17 Sustainable Development Goals Advocates, the Crown Princess joined the international community during the Conference week to show her dedication and commitment to help save our ocean. Addressing the side event aimed at presenting and discussing the efforts by companies in SeaBOS (Seafood Business for Ocean Stewardship), a science-based sustainability initiative involving nine of the world’s largest seafood companies, Crown Princess Victoria spoke passionately about the critical state of our ocean. “Have you ever experienced a forest fire?,” she asked the well-attended auditorium, referring to one of the largest forest fires that Sweden experienced a few years ago. “The roaring flames. The massive heat. The smoke. It is a dramatic experience – even frightening,” she said. “Looking out at the sea, on the other hand, is a very different experience,” she continued describing a stunning, peaceful view. “But the beautiful surface is not telling the whole truth. Overfishing, global warming and pollution are destroying the ocean. Not with flames and smoke, like a fire. But silently, invisibly, deadly,” the Crown Princess said. “All alarm bells are ringing: We are coming dangerously close to fatal tipping points,” she said, noting the critical role that the ocean plays for life on earth. She also described the role of the seafood industry, stressing that all food that we get from the ocean needs to be produced in a sustainable way. 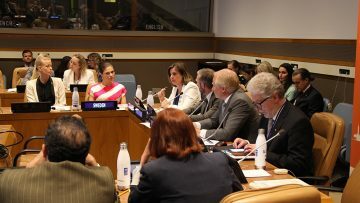 Crown Princess Victoria praised the SeaBOS initiative aimed towards sustainable seafood action by connecting the global seafood business to science; wild capture fisheries to aquaculture; and European and North American companies to Asian companies. SeaBOS is also one of the 1,328 voluntary commitments made in connection with the Ocean Conference. Deputy Prime Minister of Sweden, Isabella Lövin also commended the initiative and looked back on a successful week and Ocean Conference, an event for which Sweden has held the co-presidency together with Fiji. “When we discuss climate change, it is difficult to see it in front of you, but for the degradation of the ocean, we can see it in front of us,” Ms. Lövin said. “We feel it in our hearts that this is not tolerable anymore,” she said, also praising the fact that the Conference had raised our awareness on plastic litter. Ms. Lövin said we had let “the genie out of the bottle”, and that “we will not be able to put it back again”.